In the early months of 1932, the Toronto Daily Star reported on the attempts of Ukrainians to cross the Dniester River from the USSR to Romania. They were fired upon by Soviet border guards as they attempted to make their way to the other side. Readers must have asked themselves, what were they fleeing? Other articles in the Western press provided at least a partial answer. The following selections from the Canadian press provide a sense of what information was available to readers in Canada about conditions in the USSR in 1932 and 1933. A mix of pieces have been chosen—wire service copy, reports by Canadian correspondents, editorials, a letter to the editor, as well as a piece about a Canadian engineer who had recently returned from the Soviet Union. All address famine or starvation, usually in connection with Soviet Ukraine. HREC is supporting the Kule Ukrainian Canadian Studies Centre in conducting an investigation of mainstream Canadian English-language newspapers, particularly from cities with substantial Ukrainian communities (starting with Winnipeg, the home of the Canadian grain exchange), with the aim of culling material on and related to the Holodomor, such as the agricultural situation in the Ukrainian SSR and Soviet Union overall, and Canadian trade ties with the USSR. 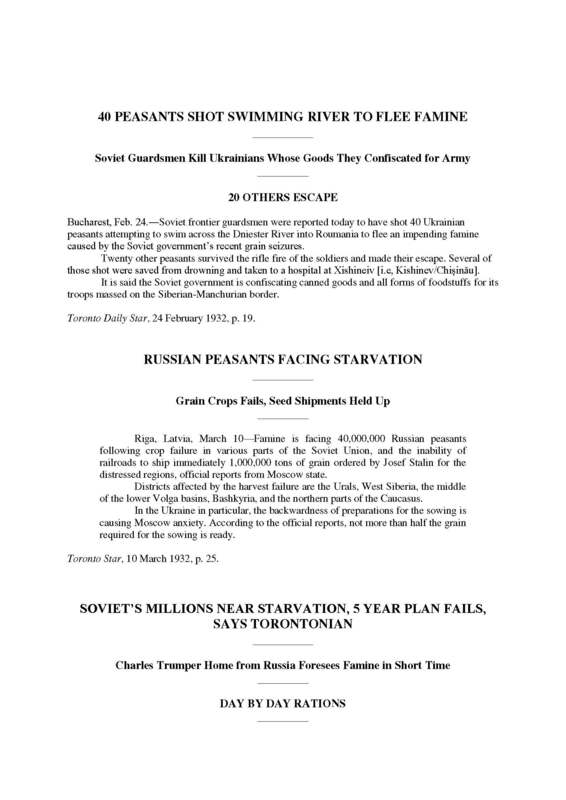 Research to date has provided a wealth of material demonstrating that a significant amount of revealing and accurate information about the Holodomor could be found in Canadian dailies during and immediately after the Holodomor, belying the widespread belief that little was known about the famine because of a successful Soviet cover-up. The selection found here represents only a sampling of the coverage of the agricultural situation in Ukraine, the Kuban, and other areas affected by famine in the critical years of 1932–33.